Herbert Weir Smyth’s Greek Grammar has been a standard tool for students and scholars of Greek for over a hundred years. Focusing on Attic Greek, but giving examples from a wide range of ancient Greek literature, this single-volume reference grammar covers all aspects of the language, from the fundamental elements of the alphabet and accents to inflection and formation of words to syntax, which takes up nearly half the volume. A previous post on Greek language tools (here) briefly discussed Smyth’s grammar. This post provides additional information on the different editions of Smyth and how to cite them. In recognition of its status as a standard reference work, SBLHS recommends citing Smyth simply by referencing the author’s last name along with the section and, when necessary, subsection. Smyth Smyth, Herbert Weir. Greek Grammar. Revised by Gordon M. Messing. Cambridge: Harvard University Press, 1956. Authors may also use the abbreviation “Smyth” for later printings of this same edition (e.g., 1984, when the copyright was renewed). In short, “Smyth” should be used for the Harvard University Press edition of Smyth’s grammar, revised by Gordon Messing. This is the standard edition used in academic publications. Smyth, Herbert Weir. A Greek Grammar for Colleges. New York: American Book Company, 1920. Since this 1920 edition is in the public domain, it is available freely online and is the basis of the version of Smyth’s grammar available through the Perseus Digital Library. Messing’s revisions and corrections were relatively minor. Note, for example, that the number of pages is the same, and many of the section numbers are also the same. 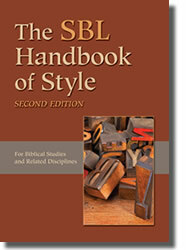 However, to avoid confusion, SBL Press recommends using “Smyth” to refer only to the standard edition revised by Messing. Authors converting citations from the 1920 edition to the 1956 edition should be careful to ensure that the section numbers remain the same. Smyth, Herbert Weir. A Greek Grammar for Schools and Colleges. New York: American Book Company, 1916. This grammar is considerably shorter than the 1920 and 1956 editions. Due to the pervasive differences between this book and the later editions of Smyth’s grammar, authors should not use the abbreviation “Smyth” to cite this volume. A final word is necessary regarding recent reprint editions. Since Smyth’s 1916 and 1920 grammars are now in the public domain, various publishers have recently produced low-cost copies, many of questionable quality and sometimes using altered or shortened titles that make it difficult to determine which edition it contains. For instance, the Benediction Classics edition (2010) bearing Greek Grammar on the cover is in fact the 1916 work, A Greek Grammar for Schools and Colleges. Care is thus advised in determining the correct publication information for any edition of Smyth’s Grammar. The standard 1956 revised edition from Harvard University Press can be identified by its ISBN: 9780674362505.